Ever since I arrived in Japan I have held a – some would say irrational – prejudice against Roppongi. Admittedly based on little more than an after-work trawl through the area’s multiple British pubs and a few horror stories heard about the clientele of the ‘all you can drink’ nightclubs, I was content to describe it to a visiting friend as something she could comfortably miss off her itinerary. ‘Like drinking in Leicester Square in London’, I said, ‘fine for idiots who don’t know better and tourists’. But, as with holders of all other prejudices, close examination proves me to be the idiot for damning the whole neighbourhood based on a couple of dodgy nightspots. 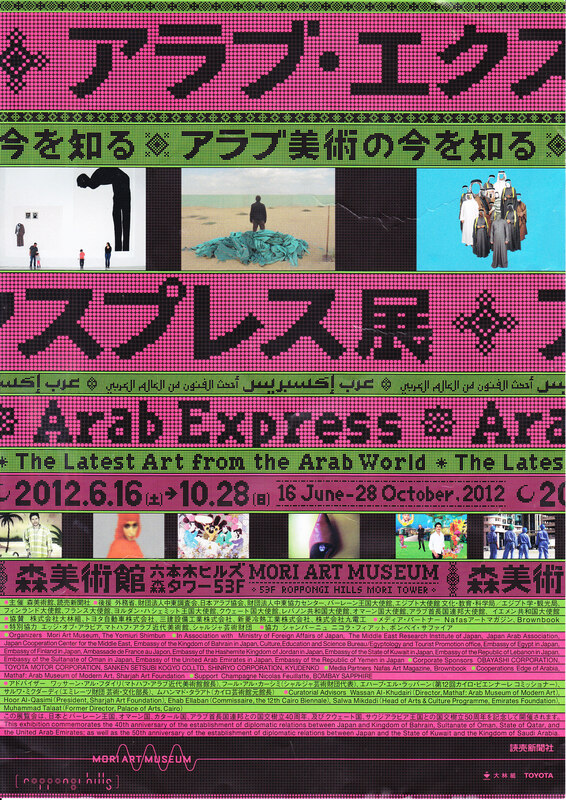 Today I was lucky enough to be invited to Roppongi’s Mori Art Museum for the ‘Arab Express: The Latest Art from the Arab World’ exhibition, which runs until 28 October. You would be daft to let a similarly irrational aversion prevent you from seeing it. The exhibition, the first of its kind to be held in Japan, opens by noting a significant parallel in the way both the Arab and Asian nations are viewed by outsiders. The diverse natures of both regions are often dismissed as offering little more than their stereotypes, be that veiled women for one or geisha for the other. The artists in the Mori’s exhibition play with these stereotypes in various ways, from Halim Al-Karim’s ‘Untitled 1’, with its indistinct red-clad figure to Maha Mustafa’s ‘Black Fountain’. The latter splashing oily droplets all over a white room whose windows look out over the Tokyo landscape, reminding the viewer that while one country’s problems are caused by a lack of natural resources, another’s spring from an abundance of them. The Arab Express curators are aware that for many people, the first thing they think of when considering the region will be its conflicts. The artist always has a choice about how much reality to include or ignore and many of those represented here wrestle with these concerns. In ‘To Be Continued’, Palestinian artist Sharif Waked confronts our fears with his depiction of a typical suicide bomber’s video which, on closer inspection of its subtitles, has the protagonist reading from One Thousand and One Nights. ‘The Story of a Pyromaniac Photographer’, included in Joana Hadjithomas and Khalil Joreige’s ‘Wonder Beirut’, features depictions of the once-popular tourist attractions of the ‘Paris of the East’, the negatives burnt by the photographer after the outbreak of the civil war in an attempt to make the pictures resemble the city he found himself living in. It is a powerful and thought-provoking collection, yet not without moments of humour, even including a series of works which reference the Japanese trend for purikura. Capturing the diverse cultures which make up the Arab World is no small challenge, yet the range of works on display will ensure you leave feeling at once informed, wrongfooted and entertained. Confront your own preconceptions at the Mori Art Museum before 28 October. Nah, I think you had it right about roppongi. The thing is, there are two roppongis. Actually three. There’s Midtown,there’s roppongi hills, and then there’s the roppongi we can all live our lives without. lol IMHO of course. Thanks for the heads up on the exhibit and lovely review. Seems well worth checking out. Definitely worth a visit, I’m glad my ‘don’t do the ‘Pong’ policy didn’t stop me checking out the highlights. Guess it begs the question, is it an actual prejudice or am I a terrible snob?